In my previous post, I discussed how I really struggled with the sin of worry during Mom’s journey with cancer. Honestly, it’s something that I have always struggled with, and something that I still struggle with. Previously, we looked at a passage from the Sermon on the Mount where Jesus discusses worry (Matthew 6:25-34). We discussed how Jesus clearly tells us NOT to worry, and therefore it is a sin. Then, we began discussing why we should not worry. We have already talked about 4 reasons we should not worry, so today, we are going to dive into the 5 other reasons. We will still be discussing this based off of the same passage from Matthew, so have your Bible handy! We should not worry because God clothes the grass (vs. 28-30). Obviously, grass doesn’t last forever. Just take a look outside when there hasn’t been a lot of rain, or during the winter months, and you will see dead grass. God cares for the grass, even though it is temporary. You, however, are not temporary. Let me clarify, the current physical body that you have is temporary; however, after death, you will either live eternally with Jesus in heaven, or apart from Him in Hell (if you want to know more about how to have eternal life, please ask me!). Our lives on this earth our temporary, but we are not. Therefore, if God cares for the grass, which withers so easily and quickly, then we can definitely trust God to care for us, who He created to be with Him forever (if we know Him). We should not worry because that’s what people who don’t know Christ do (vs. 31-32). Jesus says that worrying is something that the Pagans (people who don’t know Christ) run after. People who don’t know Christ worry because they don’t have the perfect Master/Father who they can turn to to trust to provide for their every need. Honestly, this reason hits me the hardest. If I am a follower of Christ, then I should act like it. Nothing that I do should look like the world. Daily, I should be becoming more like Christ and living a life worthy of Him. I was once an enemy of Christ and lost, but by the grace of Jesus, I have been saved. Therefore, my life should reflect this. Jesus says that by worrying, I am acting like the person that I was before I knew Him. I do not want this to be said of me. If you are in Christ and know Him, then you should not do things that a lost person does, like worrying. (Disclaimer: I fail at this daily. Although it is my heart’s desire to be more like Christ and less like the world, it’s a daily struggle, and I’m not perfect. It is when I fail when I am most thankful for the grace of Jesus, and that He covers all of my sin!). We should not worry because God knows our needs (vs. 32-33). This should bring you so much peace and comfort. There’s not much to say here, because it’s pretty self explanatory. Let this statement comfort and ease your anxious heart today. 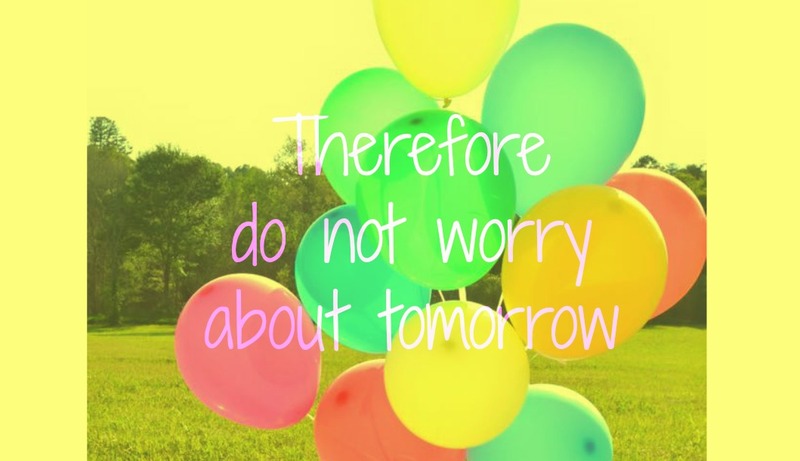 We should not worry because God is in control of what’s going to happen tomorrow (vs. 34). Our world can be a scary place sometimes, and because of that, it’s so easy to worry and fear. I know that I am so guilty of that. However, we must not forget that we serve the Risen King. We serve God, who is the same yesterday, today, and for forever. God is sovereign, and He is in control. He is and always will be on His throne. He knows the good, the bad, and the ugly that will happen to you tomorrow, 10 days from now, 10 years from now, etc. We shouldn’t worry because He’s got everything under His control. When you want to worry, rest in the sovereignty of our King Jesus instead. Dear friends, we serve a Savior who sacrificed His life for our sins by dying on the cross and then rising again 3 days later. If we can trust Him with our salvation (which we can), then can’t we stop worrying and trust Him with our lives, and I mean everything in our lives, big and small? We can, and we must. We are commanded to. Like I’ve said, I struggled with worry when Mom had cancer and even after she passed away. I can tell you from experience, the worrying was pointless. My worrying did nothing beneficial for my family or for me; it just caused me some sleepless nights. There was no need for me to worry, because God was in control. Now, I can look back and tell you that God’s plan for my mom and for my family was and is perfect. He was SO faithful to us throughout that whole season of our lives, and He still is. I had no reason to worry because Jesus continually proved Himself trustworthy and faithful, because He always is. Friends, I don’t know what you’re going through right now. Maybe you’re facing a sickness in your family like I was. Maybe you’re facing a financial situation that isn’t looking so good. Maybe you’re losing sleep at night just because you’re worried with all you have to get done the next day (guilty!). Whether you’re facing something big or small, give it over to Jesus, your good and faithful Master. Don’t fall into the sin of worrying like I did. Jesus will care for you!